Paul Brent is a Florida artist whose work is known worldwide. His paintings in watercolor and oil have deftly portrayed the many aspects of the area capturing the innate beauty on paper and canvas. He is best known for his idyllic watercolors of coastal life and is often referred to as America’s best known coastal artist. His work has shown constant progression and change throughout his career. 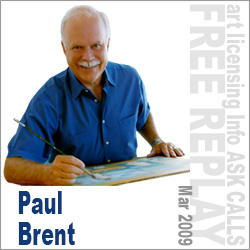 An artist, interior designer and print publisher, Paul Brent began licensing his art in 1988. Bookmarks, bed linens and insulated barware were among his first licensed products. Since then he has gone on to work with hundreds of manufacturers, and grown his licensing business to be one of the most successful in the industry. Here Paul offers his thoughts on the world of art licensing. . . !